We used the VUB library to access databases such as Pubmed, Web of science and Google scholar to find articles related to slipping rib syndrome. As search keywords we used terms like ‘slipping rib’, ‘Cyriax syndrome’, ‘clicking rib’, ‘twelfth rib’, ‘rib-tip syndrome’, ‘painful rib syndrome’, ‘syndrome of hypersensitive xiphoid’, ‘intercostal neuralgia’ and other synonyms in combination with the following titles and their synonyms. The slipping rib syndrome or Cyriax’ syndrome is an infrequent cause of thoracic and upper abdominal intermittent pain and is thought to arise from hypermobility of the rib cartilage of the false and floating ribs (these are the most involved in this syndrome)  .This may cause a disruption and allows the costal cartilage tips to subluxate and irritate the intercostal nerves . It’s an often mis- or underdiagnosed condition and can consequently cause months and even years of unresolved pain. Patients may sometimes describe a “slipping” movement of the ribs or a “popping sensation” . This condition may mimic many visceral types of discomfort, leading to ordering of many needless laboratory and radiological tests . The syndrome can be diagnosed by a clinical test (the hooking maneuver) and is often related to direct or indirect trauma (which can be neglected or forgotten), constrained posture and previous abdominal surgery. The slipping rib syndrome is a condition in the area of the thorax, which consist out of a lot of structures: a sternum, different kinds of ribs, thoracic vertebrae, muscles, nerves, arteries and veins (see figure 1 - 3). All the ribs are attached to the thoracic vertebrae. In most cases the slipping rib syndrome has an impact on the false ribs, mostly the 10th, occasionally the 8th or 9th rib. Because of their weak connection, there is an increased mobility and greater susceptibility to trauma . Anterior rib hypermobility is also likely to cause problems in the posterior thoracic area, because it’s a closed system . Further, local inflammation and/or muscle spasms of the multifidi, rotatores and levator costalis can occur . The ‘Slipping rib syndrome’ affects 20% to 40% of the general population during their lifetime . The syndrome appears to be a fairly common and underdiagnosed chronic pain syndrome. It is caused by hypermobility of the rib cartilage of the false and floating ribs (mostly involved in this syndrome), this allows the costal cartilage tips to subluxate and irritate the intercostal nerves. This hypermobility is thought to be the primary cause of slipping rib syndrome, and can be the result of thoracic or abdominal trauma (which can be neglected or forgotten) but this does not have to be . Other causes could be constrained postures and previous abdominal surgery . Also people who play sports with higher risks for chest wall impacts (e.g. rugby, hockey, football players,…) have a higher probability to get the syndrome . There also may be a history of minor or significant trauma to the chest, but this history may not be obtainable. This condition may occur at any age, but is reportedly more common in middle-aged adults, and is a relatively uncommon, but recognized cause of recurrent lower chest and/or upper abdomen pain in adolescents . This disorder appears to be less common in young children because of the flexibility of their chests . There is no difference in prevalence of the syndrome between men and women . Signs and symptoms are usually unilateral, however there are also cases where patients reported bilateral pain. The intense pain is usually described by patients as a intermittent sharp stabbing pain followed by a constant monotonous pain that may last from several hours to many weeks .The range of severity of pain varies from being a minor nuisance, moderately severe to interfering with activities of daily living .The pain may also be reported to radiate from the costochondral area to the chest or to the same level in the back . The pain is also exacerbated by certain postures and movements: lying or turning in bed, rising from a chair, driving, stretching, reaching, lifting, bending, twisting the trunk, coughing, walking, or bearing loads . Thus, this condition may affect sporting activities involving trunk movements and deep breathing, but in particular running, horseback riding , arm abduction, or swimming . Pain may be severe enough to make patients stop playing sports. The slippage or movement of the rib can lead to an irritation of the intercostal nerve, strain of the intercostal muscles, sprain of the lower costal cartilage or general inflammation in the affected area  . This causes severe pain and patients may describe a slipping movement or a ‘popping’, ‘clicking’ or ‘giving way’ sensation . Visceral innervation converges at the same spinal cord levels as slipping ribs and intercostal nerves. Because of this close association of the intercostal nerves and the sympathetic system, slipping rib syndrome may also cause a variety of somatic and visceral complaints, such as biliary or renal colic . The differential diagnosis of slipping rib syndrome includes a variety of conditions, such as (1) cholecystitis, (2) esophagitis, (3) gastric ulcer, (4) hepato-splenic abnormalities, (5) rib fracture, (6) inflammation of the chondral cartilage, and (7) pleuritic chest pain . The diagnosis of the slipping rib syndrome is one of exclusion, abdominal or thoracic diseases need to be ruled out . The slipping rib syndrome can be diagnosed by sonography and physical examination. It is often overlooked because of the lack of available paraclinical procedures and because CT scans have almost replaced a thorough clinical examination for patients with flank pain . Interchondral joints can be precisely depicted with sonography. Sonography with a high-frequency linear probe shows accurately the luxation of the cartilaginous rib, which can be triggered by Valsalva maneuvers . Sonography is also used to exclude other causes of thoracic pain such as rib fractures, Tietze syndrome, abscesses, metastases, muscle tears, pleuritis, and abdominal diseases . 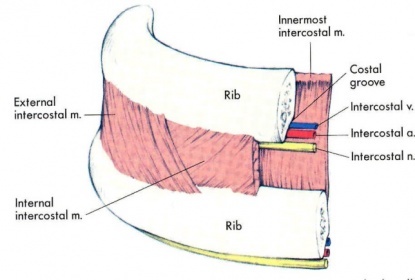 Palpation of the affected rib will reveal a tender spot on the costal margin and reproduce the specific pain. The hooking maneuver, first described in 1977, is a relatively simple clinical test which can be used to diagnose the syndrome. It can be combined with an intercostal nerve block , to see if the pain can be relieved. Also the Valsalva Maneuver can be used. For more information see outcome measures and examination . Generally radiologic imaging is not useful in the diagnosis of slipping rib syndrome, but it can be used to exclude the other conditions in the differential diagnosis. Laparoscopies have been performed in attempts to unsuccessfully diagnose and treat the upper abdominal pain . To look for an association between certain movements or postures and pain intensity . Determine if the patient has experienced recent trauma (although not always present). The physiotherapist can reproduce chest pain by palpation of the ribs and chest wall . Reproduce the symptoms (see characteristics) with the hooking maneuver. This is a relatively simple clinical test where the clinician places his or her fingers under the lower costal margin and pulls the hand in an anterior direction. Pain or clicking indicates a positive test (See examination). The physiotherapist can look for rib restriction by observing a lack of symmetry of the posterior chest wall movements on deep breathing. During the Valsalva maneuver, it is possible to palpate the slipping of the rib as the abdominal muscles contract  (See examination). The PSFS has been stated to be a valid, reproducible, and responsive outcome measure for patients with neck pain, back pain, and upper quarter complaints . To measure the patient’s subjective rate of improvement, the groc has been stated to be reliable . The physiotherapist looks for an association between certain movements or postures and pain intensity (signs and symptoms), determines if the patient has experienced recent trauma (not always present), constrained posture, or previous abdominal surgery and reproduces the symptoms (eg, pain, clicking) . Classically, the pain occurs in the upper abdomen or lower chest, in the abdominal wall and above the anterior costal margin. At that place the involved costal cartilage moves more freely than normal and the examiner can typically feel tenderness. A painful click is sometimes felt over the tip of the involved costal cartilage with certain movements. See clinical presentation for more information. There are two tests for investigating Slipping rib syndrome: the Hooking maneuver and Valsalva maneuver. Palpation or compression can reproduce chest pain when the patient has the slipping rib syndrome. Also the sit-up test is positive in reproducing the pain . During the Valsalva maneuver the patiënt should forceful exhale against a closed airway (closing mouth and nose) and hereby contract the rectus muscle. During this contraction there is an overlapping movement of the rib above, when the contraction increases, the ribs are slowly pushed in and simultaneously a rebound effect is perceptible at the very moment the patient feels pain. The slipping movement of the affected rib along the margin of the rib above, can be felt as a click under the fingers of the examiner . At physical examination, the most common finding in a case of slipping rib syndrome is the tenderness above the costal margin. The physiotherapist can reproduce chest pain by palpation . The treatment of slipping rib syndrome is possible by a multidisciplinary approach. It consists of surgeons, pain clinic specialists, radiologists, psychiatrists, and physiotherapists  (LoE 4). In the event of short-term pain relief, the more invasive procedures can be considered, which may be determined by the patient  (LoE4). These could include intercostal nerve blocks, percutaneous dorsal root ganglion radiofrequency thermo-coagulation performed under local anaesthetic with X-ray screening, and rarely rib excision  (LoE 4). Local anaesthetic (intercostal) nerve blocks and long-acting steroïd to the affected rib tip(s)  (LoE 5). Nerve blocks involve the injection of an anesthetic, a corticosteroid and other agents onto or near a nerve, usually for pain relief or anesthesia. It usually lasts hours or days. The procedure can easily be repeated if required. The immediate relief afforded by this procedure is often sufficient to reassure the patient of the ‘musculo-skeletal’ pain diagnosis  (LoE 2C). Local anaesthetic nerve blocks were proven useful in some studies  (LoE 3A,5). Supplementation of corticosteroids can give varying amounts of relief  (LoE 3A,4). Analgesics : NSAID might be value  (LoE 5). Wiring of a ‘slipping rib’ through the costo-chondral junction has been described but is rarely required  (LoE 5). Rib excision  (LoE 5,4): At failure of this general management, removal of the anterior end of the rib and costal cartilage may be performed. This has many reports of successful outcomes, reported in the literature (LoE 4). They make an incision along the costal margin (directly over the point of maximum tenderness). The eighth, ninth or tenth ribs are almost always involved. You must take care to inspect all three ribs and perform appropriate resection. Pulse radiofrequency treatment of dorsal root ganglion(LoE 5,1B). Percutaneous dorsal root ganglion radiofrequency thermo-coagulation performed under local anaesthetic with X-ray screening. Recognition and education of the condition . The patient can be taught to avoid movements and positions that provoke the pain without creating asymmetric overcharge in other regions of the body (LoE 3A). Reassurance of the benign nature of the disease combined with explanation and advice concerning postural avoidance  (LoE 3A). Using heat (hot packs) or cold (ice), ultrasound and NSAID to the affected rib might be of value in relieving the pain for intermittent periods  (LoE 5). Manual therapy by a chiropractor or physical therapist: manipulation of the costovertebral joint and electric stimulation can help manage the pain, but probably no long term relief . The therapeutic attitude is far from consolidated. Most authors advise treatment depending on the intensity of pain. In moderate pain, we recommend wearing an elastic bandage around the thorax for 1 to 2 weeks, associated with pain treatment and psychological support  (LoE 4). Wiring of a ‘slipping rib’ through the costo-chondral junction has been described but is rarely required . There is a lack of articles that describe the physical treatment of slipping rib syndrome. For that reason we used some other conditions that have a connection to this disease. We found an article that gives some guidance of moderate evidence (LoE 3A) of the physical treatment of Chest Wall Syndrome (Generic Term of Slipping Rib Syndrome). This article suggests as part of the treatment to give the patient a good explanation of the mechanism of the disease and proposes a logical postural avoidance. With this approach the patient is limited in his movements and may better tolerate the discomfort. 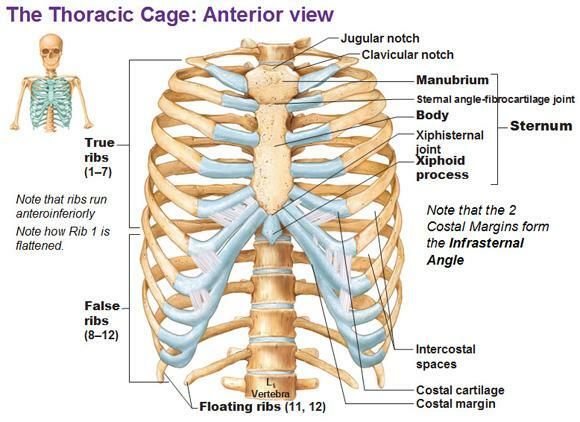 Strapping the ribs has provided limited relief in a few cases (LoE 3A). Manipulative techniques may treat this syndrome, for example the manipulation of the costovertebral joint in combination with anaesthetic nerve blocks and/or corticosteroids injections . A subluxating rib is a symptom of slipping rib syndrome, that’s the reason why we can inspire us on this article with low evidence (LoE 5). Muscle training of the small local muscles, such as the Multifidi, rotatores and levator costalis in an attempt to stabilize the sprained costovertebral and costotransversal joints (LoE 5). For example: Core stability training. Rib mobilization with movement (MWM) as proposed by Brian Mulligan. The range of motion and pain level are evaluated. A cranial glide is applied over the lateral aspect of the rib above the painful region. While sustaining this rib elevation (unloading), the patient is asked to rotate again while ROM and pain are once again evaluated. If there is no change, the technique is repeated on a rib above or below. 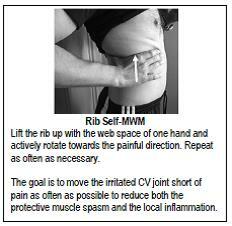 If MWM on a rib at a specific level is found to reduce or eliminate the pain, it is repeated 10 times . A home program of self MWM may be provided. Instruction: “lift the rib up with the web space of one hand and actively rotate towards the painful direction, repeat as often as necessary”. The goal is to move the irritated costovertebral joint without pain as often as possible to reduce both the protective muscle spasm and the local inflammation  (LoE 5). 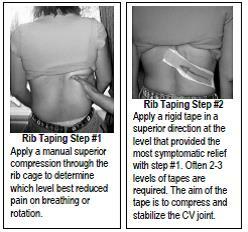 Taping of ribs can possibly provide some temporary relief. To decide on the location and direction of taping, apply a manual superior compression force through the postero-lateral aspect of the rib cage. Now ask the patient to take in a deep breath or rotate. If the patient notes a significant improvement in symptoms, then apply the tape at that level . This condition has also as purpose restoring normal thoracic and rib joint movement. Diversified manipulation (high-velocity, low-amplitude [HVLA]) of posterior joints, and manipulation of anterior joints by means of an activator, helps restoring the normal thoracic and rib joint movement  (LoE 4). All information used for this physiopedia subject is found on Pubmed, Physiopedia and Web Of Science. The Slipping rib syndrome is an often under diagnosed disease for which sometimes comprehensive diagnostic evaluation is performed. Knowledge of the slipping rib syndrome can lead to quick and simple diagnosis and prevent months or years of chronic complaints. The impingement can cause severe constant monotonous pain and a slipping sensation provoked by several movements. It can also lead to an irritation of the intercostal nerve or problems to structures in that area. This because of the hypermobility of the anterior ends of the false rib costal cartilages often related to trauma. Therefore knowledge of the syndrome is important; it can lead to quick and simple diagnosis. Radiological imaging (sonography) and physical examination could help ruling out other conditions. Treatment of pain should be the first step; by medication or placement of a nerve block. If this is not conclusive a partial resection of the rib can be performed. About the physical management for this condition there isn’t a lot of evidence, only patient education, using heat and ultrasound, using elastic bandage for 1 to 2 weeks associated with pain treatment and psychological support. But there are some advises for other conditions, like chest wall syndrome, Tietze syndrome and subluxating rib, that we can use for the treatment of the slipping rib syndrome. Slipping rib syndrome remains rarely recognized and frequently undiagnosed or misdiagnosed. Awareness of this condition may prevent extensive and unnecessary diagnostic evaluation and avoid chronic debilitating pain. Persistent lower chest and/or upper abdomen pain after analgesic treatment may suggest the possibility of this disorder. The diagnosis of this syndrome, is a clinical one, based on history and the hooking maneuver. A few cases have been published in the literature, giving no clear consensus about the treatment of this condition. In this overview article, clinical manifestations, diagnostic approach, and treatment modalities of this syndrome will be discussed.